Convert To For Processing – This option is for when using multiple currencies. It is possible that not every gateway you use will accept all the currencies you offer on your site and so for those that don’t, you can choose a currency here for WHMCS to convert to before sending to them. For example if using Google Checkout with a UK account but offering prices in GBP & USD, you would need to select GBP in the Convert To box. This will use the rates set in Setup > Payments > Currencies to do the conversion which can be set to auto update daily. The following is a list of all the payment gateways that are included in WHMCS by default. Merchant Gateways store credit card information securely in the WHMCS database whilst Third Party Gateways take the client to the provider's website to process payments off-site. Tokenisation Gateways are a happy medium where repeat billing is possible by storing the original transaction details or a reference number, not the full credit card number, thus reducing your PCI liabilities. Please note that for tokenisation gateways, the client will need to pay an invoice manually using their credit card details before their information is transmitted to the merchant provider and a profile is created in their systems. They then send back a token to WHMCS which will be used for managing the card detail update requests via the client area and recurring payments. The type of payment gateway selected influences which invoice notification email template it sent; Third Party Gateways will send the "Invoice Created" email template, whilst Merchant and Tokanisation Gateways will send the "Credit Card Invoice Created" email template. This allows you to customise the payment instructions to clients for the different payment processes. The type of payment gateway also influences the behaviour of the Attempt Capture button on the invoice page in the admin area. With Third Party Gateways the button will be deactivated as the client needs to click the payment button on the invoice to send payment. For Merchant Gateways and Tokanisation Gateways the button will be active and staff can click Attempt Capture to instantly capture payment from the client's credit card. Any gateways showing in blue below indicates further information relating to the setup & use of that gateway is available by clicking on the name. It is also possible to create your own gateway modules for WHMCS should you want to integrate with a gateway that isn't offered by default. Please refer to our Developer Resources section for more details. For token type gateways, which store a token to use for processing credit card payments through the merchant gateway module, the token will not be added into WHMCS until a payment has been submitted through the module. This will lead to the credit card details being stored in the database directly until the client makes a payment on an invoice through one of the token type gateway modules. Once the payment is made, the token is then fetched and replaces the credit card details within the database. Storage of the credit card details can also happen when the client updates their credit card details or when placing an order and it does not process the payment immediately. Should you no longer wish to use a particular payment gateway clicking the red (Deactivate) link beside the name will gracefully remove the gateway from the system. This will prevent any further payments being made using this gateway and automatically reassign any products/services/invoices assigned to that payment method to another option. 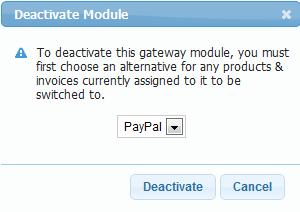 Upon clicking the deactivate link, a popup window will appear prompting for the selection of the alternative payment gateway to which any currently assigned items should be changed to. The documentation for troubleshooting problems processing payments with WHMCS are split into two sections; Gateway Specific Troubleshooting. and General Troubleshooting. We first recommend checking the General Troubleshooting section which explains how to check and correct problems which can occur with many different payment gateways. If that does not contain the solution to the problem, the next stop should be the dedicated page of the documentation relating to your payment gateway. Many contain Troubleshooting sections which explain errors that relate specifically to that payment gateway.